Today, the California Golden Seals are widely known as the most problematic franchise in the annals of professional hockey. They were one of the most disastrous teams to touch skates to ice. From 1962 to 1964, however, their minor-league predecessors, the San Francisco Seals, were undoubtedly the Western Hockey League's most successful team. The Bay Area boys, led by Orland Kurtenbach, Nick Mickoski, and Larry McNabb, won their first Patrick Cup championship in 1963 thanks to their rugged offensive game, and the cramped Cow Palace became the most inhospitable rink in the league. 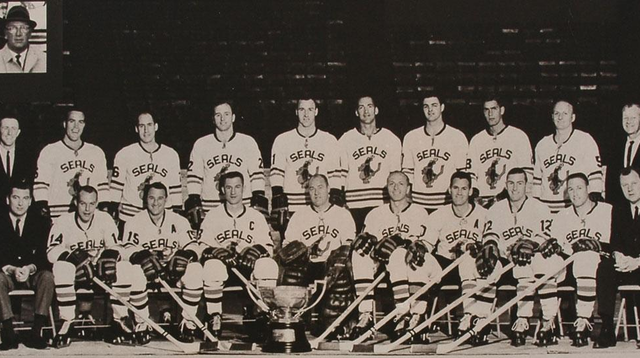 During the Seals' two championship runs the team earned the nickname "Adversity on Ice"; no matter how dire the situation, the Seals usually snagged a victory from the clutches of defeat. The subject of this article, however, is not about one of those championship seasons, but rather the Seals' overlooked 1966 playoff run, and how happenstance played a key role in hampering championship number three. Despite a second Patrick Cup title in 1964, the Seals began to show serious signs of decay. Goals scored dropped from 288 to 228, and goals against rose from 219 to 262, but the Seals woke up at the right time and proved that as long as you make the playoffs, you can capture the Cup. Bob Perreault had replaced Jim McLeod in goal, and he played admirably in the playoffs, but in 1964-65, the Seals allowed a whopping 283 goals. The Seals finished 31-37-2 and missed the playoffs. The following year, 1960 U.S. Olympic hero Jack McCartan replaced Perreault, while forwards Ron Schock, Michel Harvey, and Wayne Maxner were also added, but the Seals still looked awful early on. Helmeted Charlie Burns was forced to the sidelines for weeks with a ruptured disc, and his leadership was missed. A visiting player was asked what was wrong with the once-mighty Seals, and he responded, "You can't make chicken salad out of chicken feathers," a statement no one would have dared utter a few years earlier when Kurtenbach was patrolling the San Francisco wing. (1) Coach and general manager Norman "Bud" Poile transferred the coaching duties to Burns after just 11 games, and continued on as player-coach the rest of the season. In early March, the Seals sat 13 points out of a playoff spot, but the team clawed its way back into playoff contention. Then fate struck: McCartan injured his knee with just seven games left. Thankfully, the Detroit Red Wings loaned the Seals young Joe Daley, who promptly won six of seven, and recorded a 2.39 goals-against average with two shutouts. The Seals' Booster Club even gave Daley a special award for his inspirational play. Then the fickle finger of fate intervened. Before game two, the three other playoff teams gave the Seals permission to dress Pelletier, making him the Seals' third goalie in three games. The Leafs were ruthless, popping two goals past Pelletier before seven minutes had elapsed. The Seals' pop-gun offense managed just 21 shots, while Pelletier heroically stopped 43. Predictably, the Seals lost 3-1 and found themselves in a 0-2 hole heading back to the Cow Palace for game three. The Seals finally tightened up defensively and provided Pelletier with some coverage. Victoria took a 2-1 lead in the first period, but the Seals stormed back with two goals in the second and one more in the third to win the game, 4-2. This time, Pelletier only had to make 26 saves. Game four could have gone either way as both teams played each other closely. The score was tied 2-2 at the end of regulation, but it would not take long for the outcome to be decided. Just 2:25 into overtime, light-scoring Larry McNabb received a pass from Connelly behind the net and hammered the puck past Henderson to tie the series at two games apiece. The Seals were on an upswing, but fate intervened once again. Goaltender Doug Favell had just led Oklahoma City to the Central League title, and since he was on the Seals' eligibility list, he was asked to travel to California immediately, putting an end to the Seals-era of Pelletier's career. The only snag was Favell's flight to San Francisco was delayed by bad weather, and he did not arrive in time for the game, so Burns informed Bob Gray just 50 minutes before face-off that he would be taking Favell's place in the net. Unlike game one, Gray was sensational this time stopping 44 shots compared to just 14 saves for Henderson. The Seals hung on for dear life, and with just 54 seconds remaining, rookie Stan Gilbertson tipped a Connelly pass into the cage to give San Francisco a shocking 5-4 win. Just nine days after his shaky debut, Gray became the Seals' hero, and he gave (perhaps undeserved) credit to his defense. "The defense played fantastically and I'd have to say it's the best game I've ever won." (5) It turned out to be the last victory he would earn at this level. Normally, when a goaltender has a big night, the coach goes with the hot hand, but at the last minute Burns rolled the dice and chose to start Favell over Gray. Favell became the fifth goaltender to put on the Seals uniform in the last 13 games! Favell's unexpected playoff debut started with Gordon Redahl scoring on him just 26 seconds into the game. Victoria built up a 3-0 lead in the second period, but that's when the Seals roared to life. Connelly scored at 13:24 to close the gap to 3-1. The Seals' Ron Harris and Ron Schock exploded for goals in the opening 1:37 of the third period to tie the game 3-3. Victoria soon regained the lead, but defenseman Tom Thurlby scored with just 1:10 left to set up the second overtime session of the series. The way the series had unfolded thus far, fans must have recalled the old "Adversity on Ice" days, but on this night, the Seals ran out of miracles. The Leafs' Bob Barlow deflected a Bill Schvetz shot past Favell at 12:37 to give Victoria a 5-4 win. Favell had been spectacular in game six making 48 saves, so Burns went with his hot hand this time. Perhaps Burns had been onto something in game six when he left game five hero Bob Gray on the bench. This time, going with the hero goaltender backfired badly. According to a report in the Hayward Daily-Review, Milan Marcetta "pushed a pass from the back and side of the net and goalie Doug Favell hooked it into his own goal" just 47 seconds into the game. (6) Favell faced 33 shots in the first two periods and allowed five goals, while the Seals mustered a paltry ten shots. Gray took over for the third period, but the damage had been done. Victoria won the game, 6-1, and took the series. The Seals would never win another seven-game series, let alone a championship. The wheels of fortune viciously turned against the Seals in April 1966, and they would never spin back in the club's favour again. The Seals played one more year in the WHL as the California Seals before transferring over to the NHL where they would slog through nine torturous seasons. The franchise shifted over to Cleveland in 1976 and became the Barons, and then it disappeared entirely when it merged with the Minnesota North Stars two years later. (1) McDonald, Hugh. "Those 'Cinderella' Seals," San Mateo Times (Apr. 16, 1966), p. 8A. (2) "Seal Loss in Playoffs Protested," Oakland Tribune (Apr. 14, 1966), p. 39. (4) "Goalie Request By Seals," Hayward Daily-Review (Apr. 15, 1966), p. 27. (5) Conley, Spence. "Seals Seek Clincher Over Leafs," Oakland Tribune (Apr. 23, 1966), p. 15. (6) "S.F. Seals Buried By Sad Windup," Hayward Daily-Review (Apr. 27, 1966), p. 41.